Cook the chickpeas in water with 1 tbsp. salt and the saffron. Process cooled chickpeas, garlic, and ½ cup of the olive oil until very smooth. Season with salt and pepper, and set aside. Divide the albacore loin into 3 equal pieces, season on all sides with salt and pepper. Roll in poppy seeds to coat, then tightly wrap each piece of fish in aluminum foil, keeping the foil smooth and without crimps. Sear the tuna, still wrapped in foil, on all sides. Unwrap each piece of fish right after cooking so it does not cook further. Set aside at room temperature. Slice the fennel paper-thin. Add the lemon juice; mix gently. Add tomatoes, olives, lemon peel, and mint and remaining olive oil. Season with salt and pepper; gently toss all ingredients to coat. 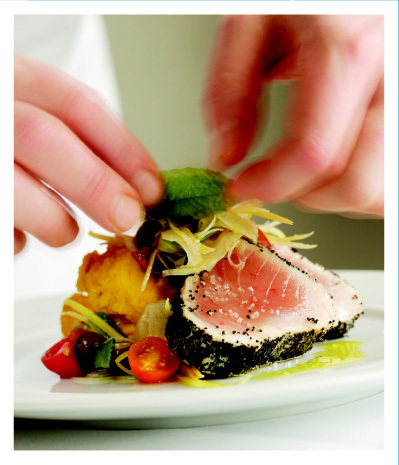 To serve, slice the albacore into ½-inch-thick pieces. Place dollop of chickpea puree in center of plate. Set albacore on plate next to the puree and sprinkle with sea salt. Top each plate with fennel salad and drizzle with more olive oil. Serve immediately.